Checked brake line to caliper - not blocked. Took rest to pieces and the the piston is seized inside master cylinder. It was only 18 months ago that the garage put in a new kit in the master cylinder. Got to try and get out the piston out of the master cylinder. Its so tight. not happy after getting so close to getting bike on the road after 14 months. Is it the same procedure for an '83 Aspencade? Also, all the '83 SS brake line kits have a rear line and two front lines which appear to be the same length. I assume that there's hard line from the rear M/C up to a point forward? Wilcoyj & Boby Biscuite.......I have an 83 Gl1100 Interstate and have been rebuilding the calipers and master brake cyliner, and I ran into the same frustrating problem that you posted. With fresh rebuild on the rear brakes, and a fresh rear master cylinder rebuild, I am having a terrible time getting any brake fluid down to the bleeder screw on the rear caliper. I was using a hand vac. and was not getting any fluid to draw thru as they show on numerous Youtube videos. I have been going crazy wondering what in the world was the problem. I eventually got a very small amount to the rear brakes over several days of pumping/bleeding, and finally got the rear calipers to close up onto the disc. But since one side of the front brake works off the rear master cylinder, I still have no brakes since the front one is off (I am trying to use the brake fluid to push off the brake pistons so I can rebuild the front one). So, I am not getting any brake fluid to the front even after the rear pistons are firmly closed on the brake pads/caliper. The hand vacuum does nothing. So now I am thinking that the brake line might be clogged as was the case with you. Isnt there also a "Tee" connection in the brake line that has a pressure valve in it? Guess I just need to pop it open and use compressed air into the line to unclog it. Do not know if there is a tee or not. I used brake cleaner into the line and blew it thru the lines with compressed air. Took several tries but I finally got a black glob out of the line. I went from master to caliper then switched and went from caliper to master. Then I did the same to the front caliper. Good luck you'll get it. Wilcoy......Thanks.......I will give try the compressed air tomorrow and see if that does the trick. I would have never thought that the lines might be clogged if I had not seen these posts.....this site is a big help for sure. make sure you have plenty of rags around every thing. Don't want the brake fluid to get on any paint. Wilcoy......Rags....thats a big 10-4 from my backdoor. We will make our old Wings Great Again. My problem was the rear master cylinder - although the connecting arm was going in and out, it was not actually pushing the piston down the bore. So no brake fluid was going through. I actually replaced the rear master cylinder from one advertised on ebay as working - popped that one in and hey presto it worked - brakes bled very easily to be honest. 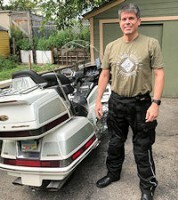 Went out last Saturday on my goldwing (as I just got it back on the road after 15 months) and rode 100 miles as a tester - during next week hoping to get out for a longer 250 mile round trip. 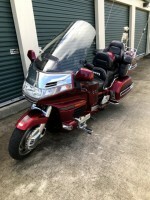 If you are comparing Trump to Goldwings then it could be the end for Goldwings lol. I would hate to be living the the USA at the moment - not a good choice of candidates but I think better the devil you know! bobby biscuit......Yep, my first try on the rear master cylinder I did not replace the rubber seals since they looked fine. I think I goofed when I put some 10w30 oil on the rubber seals thinking some oil would be good for them. I think that caused them to swell up some and when I put it back on, the internal spring would not push back the piston with seal very good. So I had to get a rebuild kit, and the guy told me to ONLY use the enclosed red vegetable based grease and never oil. Got that on, and it pumps back and forth fine....but not pumping much brake fluid. So, Im hoping its just the line partially clogged up. Good to see you are putting some miles on your bike......as soon as I get these brakes working, I can give this naked wing a good try. I got the engine running super fine, and cant wait to see how she compares to my fully dressed wing. Trump.....well, I will admit that I fully support him and his views. Just hope the polls are not rigged enough to cause that sick corrupt evil Killery to move into the white house. 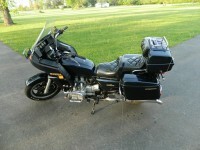 Love the forum and find it invaluable rebuilding my 81 Goldwing GL1100I. I ran into a problem after rebuild of rear master cyl. I had it all together, filled the reservoir to fill the cyl and flush some fresh fluid through the line. The pedal worked fine, reservoir went down about half way, no fluid ever came out the line that isn't connected to the caliper. Brake travel suddenly stopped and will not hardly move. I figured I'd give a shout out before I take it all apart again. I'm sure I put the seals, piston, etc in correctly. Any ideas? Thanks again !!! This is a great forum for the DIY folks. Another interesting symptom dealing with the master cylinder that I ran into was the small hole being partially plugged. With the bike sitting there idling the rear brake would lockup without even touching the pedal. Since it's a linked system you would think that this would affect the front but it didn't. After the bike cooled down everything was fine. I rebuilt the rear caliper but still had the same problem. Did the master found the small hole problem, everything is fine now. Shows how much expansion there is with brake fluid at the back wheel due to the close proximity of the exhaust. My front brake did the sam thing even after rebuilding the master cylinder and caliper. Replacing the brake hose with an HEL line fixed the issue. A post on another site indicated that the interior of the old hose might be collapsing and causing the problem. When it comes to old Wing brake parts and rebuild kits, I highly recommend Brakecrafters. Their kits are superb and the people knowledgeable. 82 Interstate here. My rear brake pedal completely locked up last fall. I parked the bike, and finally got around to doing the rear master cylinder this week. Lots of corrosion. The "fluid" which was coating the parts inside is more like black water than hydraulic fluid. I need to get a bunch of corrosion scraped off, and will ream out the return port really well before I reassemble. Given how bad this is, I plan to rebuild the caliper too. Then bleed any dirty fluids out of the line and refill with clean. I just wanted to repeat how GREAT this site is, and how much I appreciate all the info found here. Thanks! Sometimes, that reason is you're stupid and you make bad choices. You might want to also pull the rear brake lever off, clean off the corrosion on the pivot, pack it with tons of grease, and reassemble. That pivot corroding is a very common cause of rear brake lockup. Man am I glad you mentioned that. I expected once I had the master cylinder off that the lever would no longer be stuck in position. But it won't move without a hammer, even with everything disconnected from it. The lever's (lack of) movement got worse gradually over last season. I believe you are correct that it needs to be removed, cleaned, and greased. Anybody done this that could help me figure it out? The pivot is behind part of the frame and I don't yet see how to get the lever off the pivot. A cotter pin and washer are all that hold it on. I used Kroil on the last one I had the was getting frozen, and it worked wonders. Heat will help, too. Thanks, I will take a look from underneath or the other side to find it. I hit with a couple rounds of PB Blaster and now I can move it by hand, but it still takes a lot of force. Worth taking it apart and doing it right. 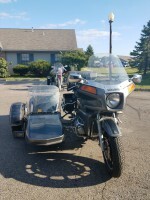 I'm having similar issues, with my 83 Aspencade/ sidecar. Thought it would be a quick flush and go. Nah. I have been scratching my head, and originally, I thought it was the rear master cylinder. Little by little, the entire brake system, well has been broke. 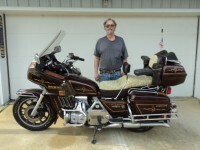 I managed to ride it to Wingdreams in Bellefontaine. The owner Tim has tried his best, and even I've been over there a few times helping him out, on my bike. After almost 6 weeks of being in and out his garage, I think it needs a complete tear down, and rebuild. So, I'm just echoing my sentiment with one of the major sticking points with this particular model. Looks like K and L will get more business from me very soon. And also looking for quality stainless brake lines...any recommendations?? The stainless steel brake line can be found in several places (google it). It's 3/16".